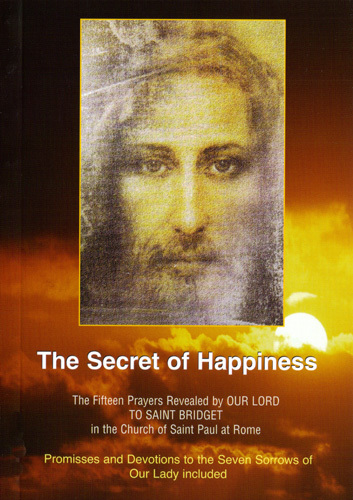 The Secret of Happiness contains the fifteen prayers revealed by Jesus to St. Bridget of Sweden in 1370s to honour the blows He received during His Passion. This booklet explains the promises of Jesus and a short biography of St. Bridget. If you would like your petition to be placed at the Shrine of Divine Mercy, please send them to us. Unfailing Novena to Our Lady Untier (Undoer) of Knots, a wonderful nine-day prayer to Our Lady. This is Pope Francis' favourite Novena. One of the fastest growing Marian Devotions in the world.